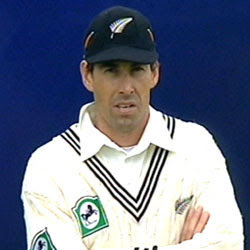 Stephen Fleming has just announced he will retire as New Zealand captain. On his resignation he has asked how he wanted to be remembered and he said he would want to be remembered as a thinker about the game, as someone who could bring together a team and make them more than the sum of their parts. If anyone needs a justification for watching sport, then the fascination of human psychology under pressure is a great one- cricket shows that often at its best. Its fiendishly complicated and incredibly thoughtful as the bowler, captain and fielders conspire to trap the batsman into playing a shot he doesn't want to play. I'm sure the Umpire will have something to say as will James Hamilton: but I think its interesting that the bit of cricket that Fleming declared he enjoyed was the thinking, the way the game could be shaped by leadership and tactics. Its one of the things I enjoy watching team sports- you can see the tactics being played out on the field. Well, you haven't convinced me there are reasons to love any sport, but this is interesting! Certainly the tactical challenge of cricket - pretty much unique amongst ball sports - is part of its appeal. Bad captaincy can cost a series - Ponting in 2005 effectively did so when choosing to bowl at Edgebaston having just lost McGrath. At the same time, it can be overrated. Ponting's record since 2005 is suggestive of a great captain but I suspect I wouldn't have had much trouble organising victories if I had Ponting batting, McGrath and Warne bowling etc.